"These eggs are a great way to start out your morning! They are easy and fast to make!" 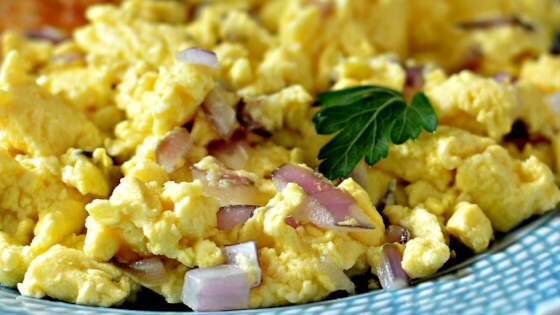 Whisk together the eggs, milk, onions, salt, and pepper in a large bowl until it looks slightly fluffy. Melt the butter in a large pan over medium to high heat; coat the pan evenly with the butter. Stir in eggs and continue stirring until they have just cooked. Serve immediately. The addition of onion is different and pretty good. I also added some chopped ham and cheddar cheese. The eggs come out very dry, need more milk I believe. Very good eggs, not perfect, but they are good. I used onion powder. Good idea. This was ok, better than plain but I wouldn't call it perfect-- depth of flavor wasn't what I expected. I left out the onion because I don't care for them. All in all this was just okay. I think I would prefer to add the pepper at the end. Also I think I like my eggs better without milk.